Yes, but the first description is the most fitting. It is recording that Sinclair does best and most—maniacally, sometimes to the fascination and sometimes to the utter perplexity and sheer boredom of his readers. All of his books have their longueurs, but often the moments of greatest fascination emerge from them. His recording can seem like that of an angel through its indifference to the usual human concerns—or perhaps it would be better to say, to the concerns we typically bring to books and other narratives. Sinclair has written of his "final renunciation of the burden of narrative." Like William Blake, his great predecessor as an occult and obsessive Londoner, and one also linked with the angelic, Sinclair's motto might well be, "Enough! Or, Too much." He gathers, consumes, and regurgitates in a seemingly endless cycle. But he also says of his four decades of gathering knowledge about Hackney, the "guiding principle" was stated by Blake: "Tho' obscured, this is the form of the Angelic land." 2. Even as Sinclair was writing his tribute to, or denunciation of, or account of—it all depends on which page you're reading—Hackney, something big was happening there, something far beyond the gradual changes endemic to any place. The apparatus of the Olympic Games came to East London. He had already noted its arrival in the Hackney book: he says there that the building sites—venues for sports, athlete housing—are "an effective cultural defoliant, an Agent Orange of edge-land jungles, marking out the flight path to dinosaur rock acts in O2, the rebranded Millennium Dome." Sinclair is offended and angered by this as by little else. That book begins with Sinclair describing, in a strangely elliptical way, a gang attack he suffered while walking through Hackney. This he shrugs off: "This is nothing, a toll on the privilege of living here; … It's my own fault, for being visible in my difference, and too ancient to be moving through this place at this hour." The book ends with a strange juxtaposition: an interview with Astrid Proll, an early member of the Baader-Meinhof terrorist gang, is intercut with visits to a blue fence that surrounds construction of Olympic venues. "An exclusion zone has been declared." Random assaults on pedestrians, the harboring of violent criminals—these are the ordinary things of the Hackney Sinclair loves. There's a place in Hackney where people dispose of guns, the same place where criminals have ditched their instruments for generations: Sinclair was shown the disposal site by an associate of the Kray twins, psychotic and murderous leaders of the London underworld decades ago. (Tradition!) But the blue fence—that's something different, and infinitely worse. 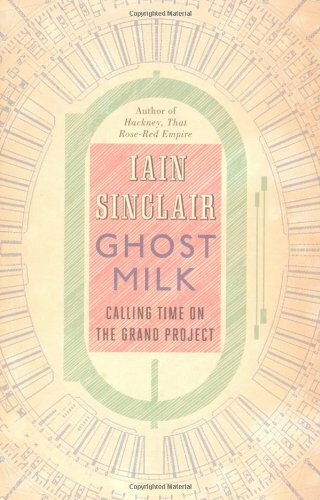 The fence generated another book, Sinclair's newest, Ghost Milk. Sinclair tells people that's the name of the book he's working on, and, asked what it means, he thinks, "cgi smears on the blue fence. Real juice from a virtual host. Embalming fluid. A soup of photographic negatives. Soul food for the dead. The universal element in which we sink and swim." Well, what does that mean? It's hard to specify. George MacDonald used to say that the purpose of fantasy was not to convey a meaning but awake a meaning, and that seems to be Sinclair's approach from the grittier end of the literary spectrum—except that what he seems to want to awaken is a sense of foreboding, dread. The "ghost milk" that oozes from the blue fence offers simulated nourishment: the Olympic organizers promise urban renewal, new possibilities for Hackney and the rest of East London, but such promises are empty, Sinclair insists. They're taking the soul of a place and leaving a few temporarily pristine buildings behind: "The pressure of regeneration, forcefed by the Olympics, is such that zones once tolerant of impoverished artists have to turn every waste lot, every previously unnoticed ruin, to profit. To provide more theoretical housing, it is necessary to unhouse those who have already fended for themselves." Similarly, in the Hackney book he had written, "We are the rubbish. Outmoded and unrequired. Dumped on wet pavings and left there for weeks, in the expectation of becoming art objects …. It is my own choice to identify with detritus in a place that has declared war on recyclers while erecting expensive memorials to the absence of memory."